Well, despite the fact that I wrote the inspirational post last week of 15 DIY curtains, I did not get the curtains done in my daughter's room. We did decide on what we are going to do and I got them all pinned, but I need to paint them and actually sew them. Instead, I decided to do a project that feels so much more simple. I decided to make some DIY room decor for her walls that had also been sitting around waiting on me since the beginning of this year. Sigh…I sure do have mommy guilt about how long it is taking me to get her room done. I've got a printable for you at the bottom of this post with full step by step directions for this project. 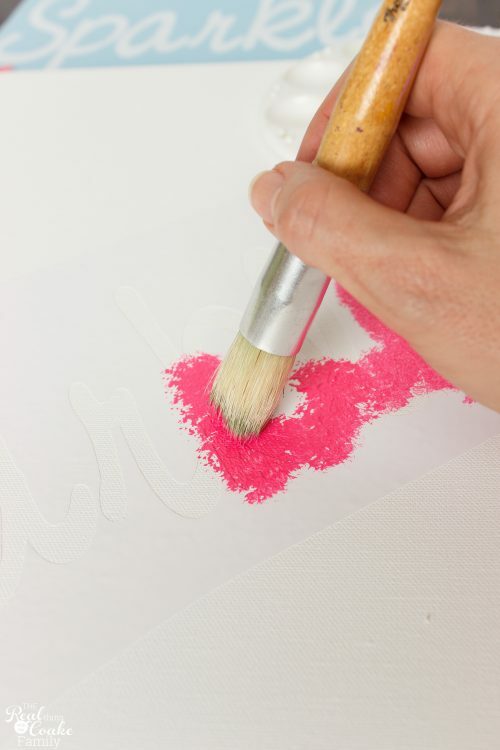 Each step has pictures so even if you have never done a project like this before you can download it, print it out and I am sure you can make your own glittery wall art. If you get going and need help, just leave me a comment below or leave me a message on facebook and I will do my best to help you through the project. The great thing is that you can make this for any word or picture you want on your walls. That is what I love about projects like these. Not only do they save me money, but the are totally personalized. I can have any wall art or picture you want on your walls. That is what I love about projects like these. Not only do they save me money, but the are totally personalized. I can have any wall art or DIY room decor I would like or that goes with what I want in that room. 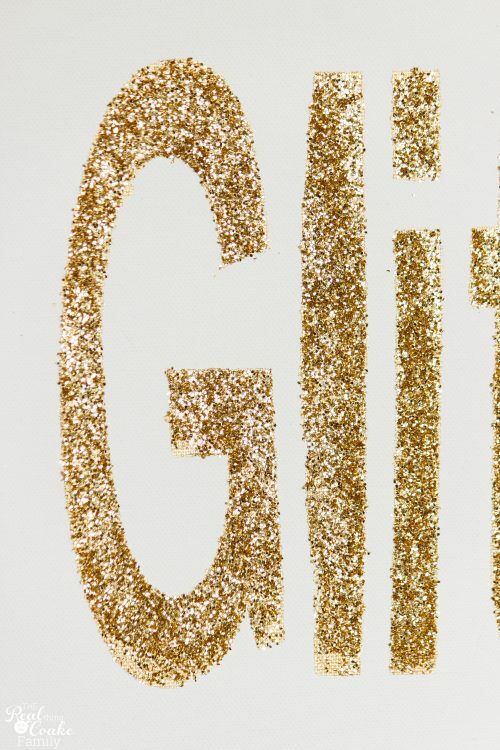 In my daughter's case, she wanted glitter and words. So easy. That is what I love about projects like these. Not only do they save me money, but the are totally personalized. I can have any wall art or DIY room decor I would like or that goes with what I want in that room. In my daughter's case, she wanted glitter and words. So easy. I love how the sparkle really sparkles. 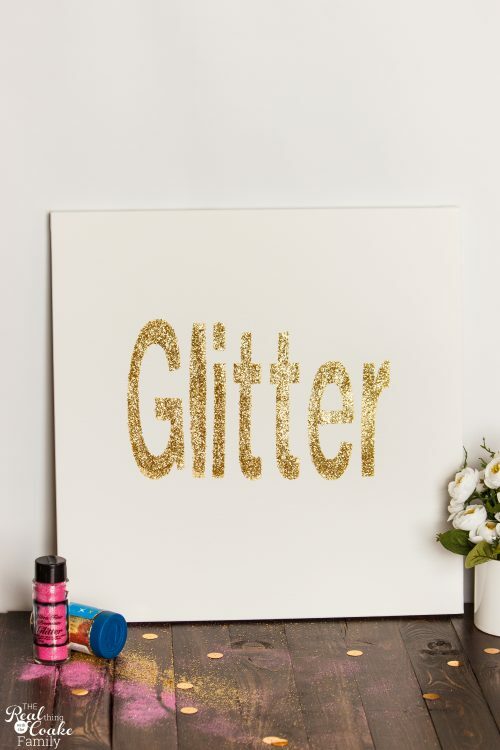 If you are going to have the word glitter on your wall….it had better actually be glittery. 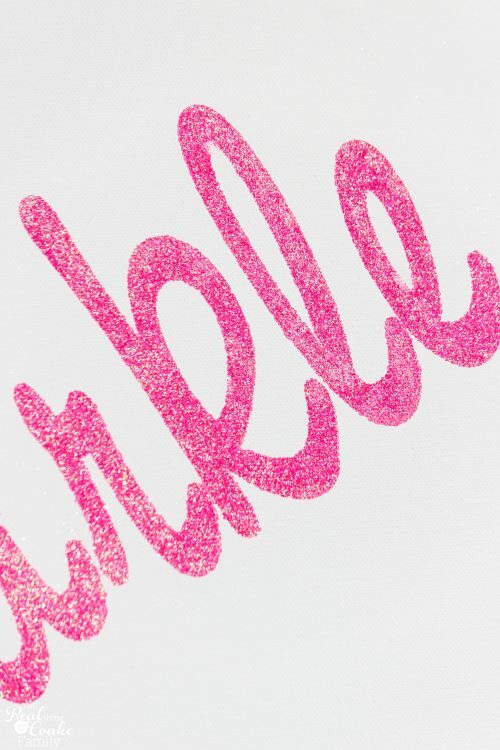 To get full coverage, I made a stencil and painted the stencil with a color similar to that of the glitter I would be applying. As you can see above, there are some spots without glitter, but the overall effect works great! 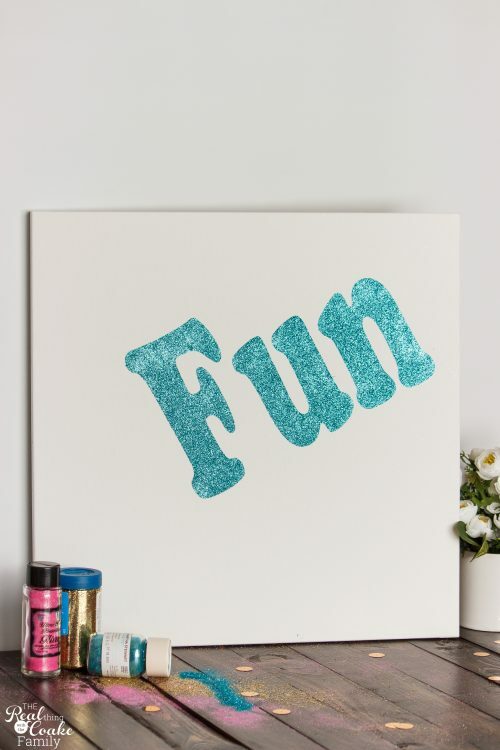 For the word fun, we used her wall paint and added a turquoise glitter I had on hand on top. It makes it close to her wall color, but not exactly. 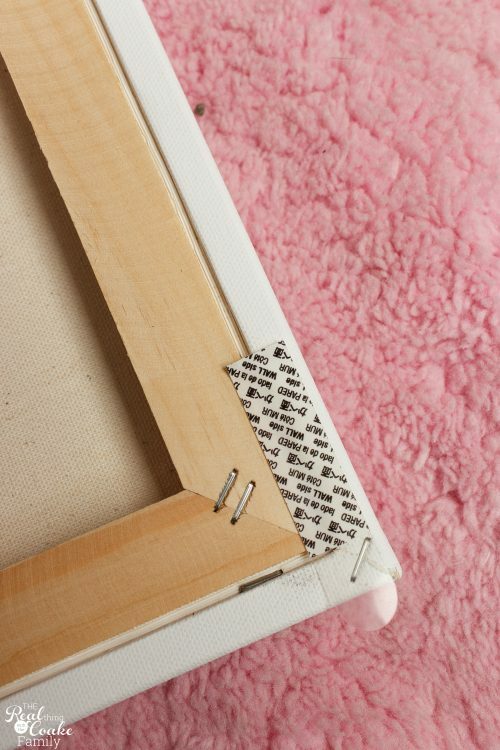 You can also just hang the wall art with the adhesive strips, but if you don't have enough or don't want to spend as much as it would cost to hang things that way, at least putting one will keep things from slipping and sliding around on your walls. We hung the three together on the wall near her bed. It looks so cute and it is so nice to see something on the walls. These are adorably fun! I love that your daughter wants to share some creative talent 🙂 Thanks so much for stopping by and sharing with us at Snickerdoodle Sunday! Pinned to share! Love this! 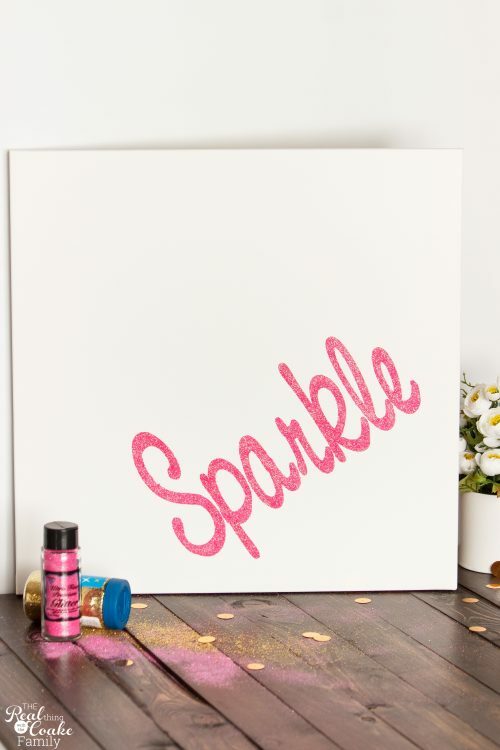 I think I will do something like this for the girls’ room! Love the command strip tip! I get so frustrated when my pictures get askew and I am constantly fixing them. I am pretty sure my husband thinks it’s funny and is the one actually making them hang crooked! Thanks so much! I loved reading your comment because I love knowing I am not the only one that crooked pictures drive nuts! 🙂 Hope it helps…won’t it be funny if you put them there without your husband knowing and seeing his response to why the pictures won’t move. Lol! What a lovely project for your daughter’s room! It sounds like she shares your same creativity. Good luck with her and her youtube channel 🙂 Thanks so much for sharing this on #shinebloghop! Thank you! She definitely shares some of my creativity!